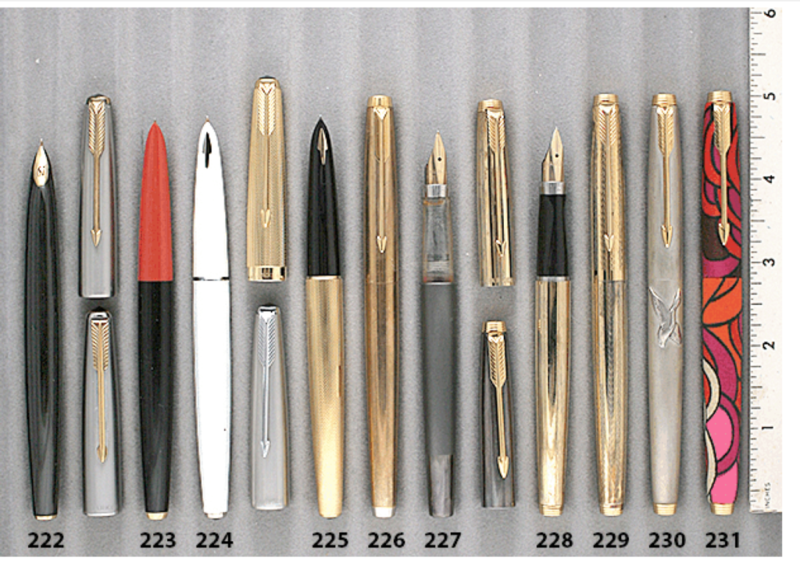 These are 1975 and 1973 Parker 75s. The first is a C/C-fill in longitudinally Brushed Sterling Silver with gold-filled trim and sterling silver “Flying Duck” applique. Gripping section with indexed chrome-plated ring. Medium “66” nib. “SO #14079.” “14079″ engraved on the gripping section threads. Near mint. The second is a 1973 Parker 75 cartridge/converter-fill in metal covered with cloth with geometric pattern. Material provided by “FRW.” “Shop Order #13821,” which also reads, “Used for 75 Modernization Fabric Treatment.” Gripping section with indexed chrome-plated band, permanently mounted into the barrel. Cap held on by friction fit. No nib. Gold-filled trim. Near mint. Item #230 and #231 in Catalog #84.